Amsterdam/Tokyo, July 2, 2014 – Yahoo! JAPAN and BoosterMedia have struck a deal to bring ‘Western-style’ HTML5 games to the Japanese market. The new cross-platform games can be played instantly on any of the Yahoo! JAPAN websites via Yahoo! Games, one of the most popular game platforms in Japan. The first series of free-to-play games selected for Yahoo! JAPAN are from popular casual game genres, such as puzzle- and match-3 games, bubble shooters and arcade & action games. 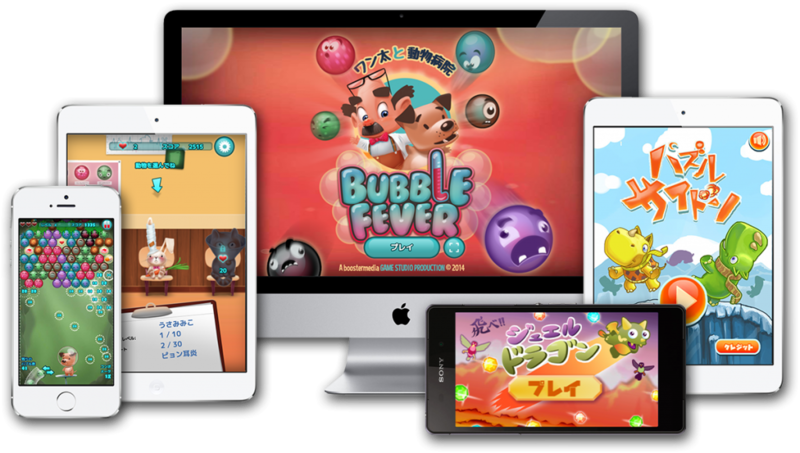 BoosterMedia has culturally localized the games – the HTML5 specialist employs native Japanese staff in both its Amsterdam-based Game Studio and Tokyo office. Although Japan has seen a massive growth in the native games market in recent years, with Gungho’s “Puzzle & Dragons” as the most successful example to date, the browser games market has seen a significant increase too, with a surge of 132% to 229 billion Yen in 2013. Contrary to most native games, they can be played on smartphones and tablets as well as desktop PC browsers. Users can log in with their Yahoo! ID to save high-scores and to see the leader-boards of other players in their area.